Where would Penang's Chulia Street (Lebuh Chulia) be without backpackers? This two-lane street that cuts west to east across the George Town, Penang historic core in Malaysia is also the first stop for backpackers visiting Penang: Its surfeit of hostels, cafés, bookstores, travel agencies, and convenience stores puts Lebuh Chulia on the top of every Penang backpacker's must-visit list. Lebuh Chulia's popularity increases tenfold after dark, as the sidewalks along Lebuh Chulia blossom with hawker carts selling a variegated menu of Malaysian street food favorites. The hawker action along Lebuh Chulia is mainly concentrated between its intersections with Lorong Love on the west and Lorong Sechchuan on the east. It's not a long stretch by any means, but the variety available within this segment of Lebuh Chulia will boggle the first-time diner's mind. The scene isn't the cleanest, though. Malaysian street food can be messy and unsanitary-looking, and ordering food isn't the easiest, especially when you're competing for the hawker's attention with a dozen other diners. It's a test for your comfort zone. "Keep an open mind!" says Mark Ng, co-founder and partner at food tour enterprise Simply Enak. 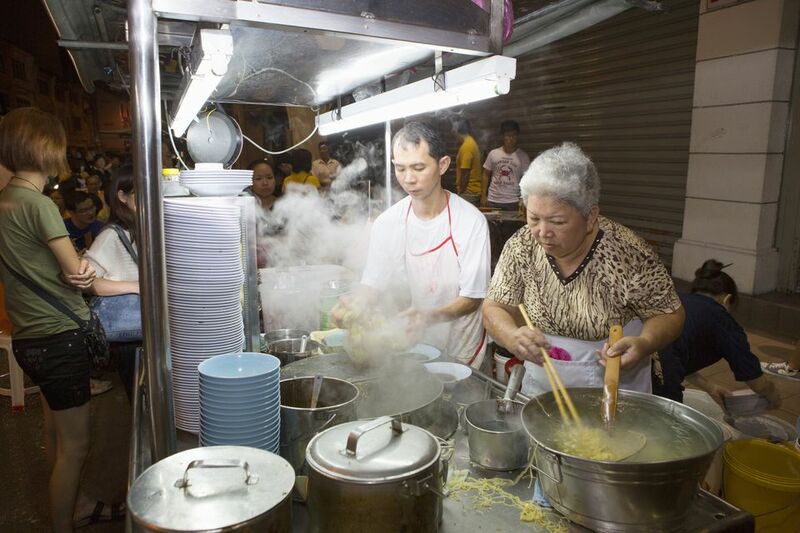 A Penang-based foodie, Mark understands the concerns visitors have about the local street eats. "Penang is all about street food; be adventurous about it. Food that is fried in high temperature and boiled in soup - generally they are fine." Here's how you know Lebuh Chulia is good: It isn't just the tourists jostling each other for streetside chow on the sidewalk. "The locals go there for the curry noodles, the wan tan mee, the kway teow soup," Mark tells us. Wan tan mee: These are opaque, thin egg noodles drowned in soup stock and garnished with wan tan (dumplings) and cha siu (barbecued pork). The soup is optional; you can have this dry, too. Curry noodles: These are egg noodles soaked in curry, coconut milk, and morsels of blood jelly, cuttlefish, cockles, and fried tofu (tau pok). Kway teow soup: A Penang classic, this noodle soup puts together clear pork stock, noodles, and an array of garnishes - mincemeat, fish balls, toasted garlic, and slices of meat. Hainanese satay: Unlike the satay you'll find in the rest of Malaysia and Indonesia, Hainanese satay uses pork as well as chicken meat; pieces are skewered on a bamboo stick and grilled over charcoal till done. Your cooked satay should be dunked in a sweet bowl of peanut sauce. This writer found the queues for all these foodstuffs too long. And as Mark explains, Penang char kway teow is completely different from the stuff you find in Singapore - in his opinion, it's simply better. "Singapore's is rather sweet compared to the one in Penang or Kuala Lumpur, it's more savory," Mark tells me. "And the texture is not all that soggy and less oily." The secret is in the temperature of the wok used to cook the ​char kway teow: "The higher the flame, the drier the texture of your kway teow," Mark explains. "There will be the feeling that it's not that oily, it's a bit dry and fragrant, a bit charred with flavor." So it was with the char kway teow dispensed by the auntie near the corner of Lorong Love: Expertly sautéed over a high heat, the resulting egg-infused noodle dish was smoky, just a little moist and not at all fatty.